Nova 7s is the latest game from Real Time Gaming and its packed full of features and symbols that will excite slot fans far and wide. The theme is deep space, which is wonderfully reflected in the amazing graphics and color scheme. Space exploration and the wonder of the unknown has forever excited mankind and now you can experience the thrill of intergalactic travel from the comfort of your own home, and with the rewards on offer you’ll soon be a huge fan of this new release. 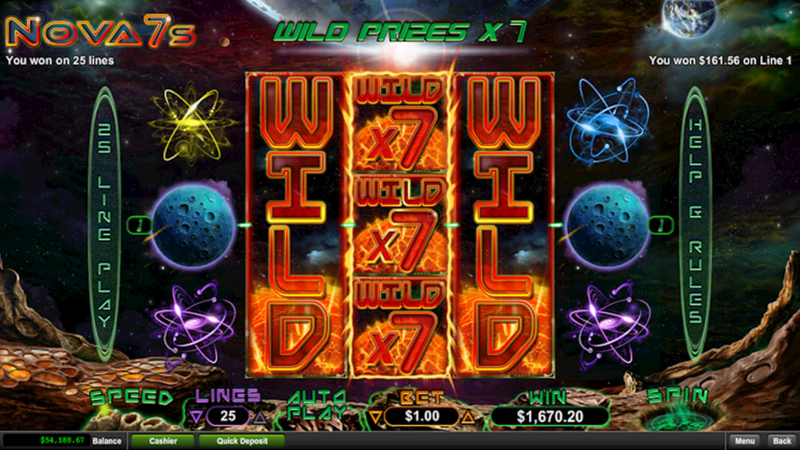 Although the game is not linked to a progressive jackpot the scatter and wild symbols will give players regular chances to win big. This is a 5 reel slot game with 25 variable paylines, players are able to select the number of paylines they wish to play with each spin. The autoplay function also allows you to adjust the speed at which the game is played, allowing you to sit back relax and enjoy the superb gameplay and graphics on offer. Perhaps the greatest thing about this game are the various features which offer the best value to players of all experience and abilities. The free game feature is triggered when 3 or more of the scattered ‘Blue 7’ appear from left to right within a regular game. The Nova 7 feature awards 7 free games alongside adding an extra ‘Red 7’ to reels 2, 3, and 4. If the Supernova 7 feature appears this will also trigger the Nova 7 feature while simultaneously multiplying all prizes by that magic number 7. The Hypernova 7 feature triggers the Supernova 7 feature, while any ‘Red 7’ wild over 3 reels triggers a re-spin, after which the pays are awarded. Finally there is the Hypernova Extreme Feature which in turn sets in motion the Hypernova 7 feature – any ‘Red 7’ wild appearing on reel 3 will expand. The scatter symbol is the blue 7, which triggers the free games feature when 3 or more appear from left to right. Scatters wins are added to line wins and multiplied by the total bet. The free games are a great way for players to get to grips with the overall slot gameplay and will certainly help you master this game. While this game doesn’t have a progressive jackpot its varied symbols, special features and different ways to win big will keep seasoned slot fans entertained for hours. When you combine this with the top jackpot of 38, 073 times the bet per line it still offers a very attractive win margin for all players.